Funky Key Rings are hand-made right in FOR MOTHER EARTH, Arkansas' LARGEST HEMP store! You can't get any more 'American Made' than that, can you? 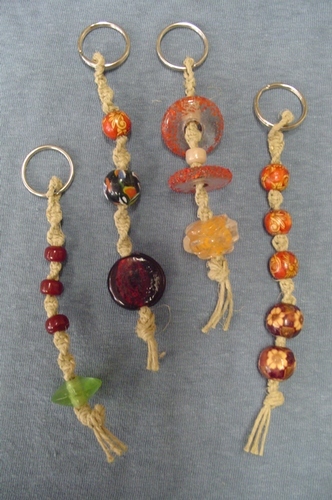 Funky Key Rings are made from sturdy, durable HEMP twine, and combinations of glass, wood and metal beads and fixings. Each Funky Key Ring is made to be unique. We vary the combinations of materials and lengths to make each Funky Key Ring to be personal and individual. Since each Funky Key Ring IS so unique, we cannot offer any real choices to the shopper. If you order one, it will be psychically chosen in the hopes of providing you one that you will treasure, enjoy, and find most useful. Remember! We offer FREE SHIPPING and NO extra packing charges!